Organic Nutmeg Essential Oil (Myristica Fragrans) - Sweetgrass&Rain Inc.
Nutmeg Essential Oil is derived from an evergreen tree capable of growing 20 meters in height. It produces a fleshy red fruit that is then dried. 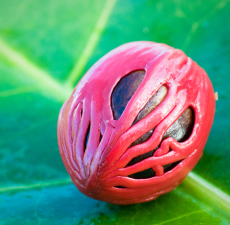 The exterior husk is dried and produces Mace, while the seeds produce Nutmeg. It has been prized as a culinary spice in ancient China, for embalming by the ancient Egyptians and by the 8th century was commonly used in Britain. In the 12th century, Hildegard of Bingen cited it in her herbal - the first known textbook on the medicinal use of herbs. Today it is used by the food and cosmetics industries, as well as in aromatherapy. Nutmeg's scent is soft, spicy and woody with a slightly sharp note.